The event welcomed approximately 25 participants, with strong representation from both state and civil society institutions relevant to prevention. 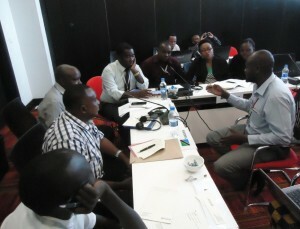 Attendees came to the training from both Tanzania and the surrounding Great Lakes Region, including participants from Kenya, Uganda, South Sudan, the Democratic Republic of Congo, and Zambia, as well as civil society representatives from Burundi. The three-day training began with a keynote address by former Tanzanian Ambassador to the United States, Ambassador Liberata Mulamula. Previously, Ambassador Mulamula was the Executive-Secretary of the International Conference of the Great Lakes Region, and a driving force behind the establishment of the TNC. 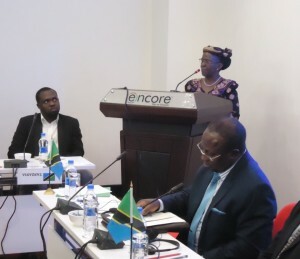 She remarked on the process of the creation of this National Committee and the importance for Tanzania, and all states, to establish and strengthen government wide approaches to genocide and mass atrocity prevention. The Ambassador was then followed by Dr. Harrison Mwakyembe, Tanzania’s Minister for Constitutional and Legal Affairs, who officially opened the training. Attendees then participated in modules on grassroots approaches to prevention and youth engagement, tools for early warning and early response, and a planning session for the design of a mass atrocity prevention project to be implemented in their home countries pertaining to the expansion of regional efforts for genocide prevention. 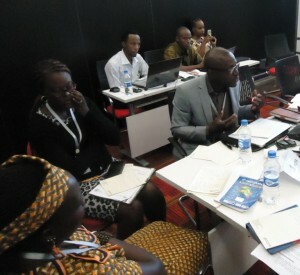 Over the subsequent two-day period, attendees participated in interactive sessions covering additional topics relevant to the work of prevention in the Great Lakes Region of Africa. In addition to the training’s titular module, which focused on institutionalizing linkages between national and regional efforts, the seminar covered topics such as the prevention of electoral violence and gave participants time to finalize and present their project plans conceived during the first day of the seminar. Mr. Jack Mayerhofer, AIPR’s Africa Programs Liaison in New York, presented AIPR’s newest resource, the Training Resource Manual for Genocide and Mass Atrocity Prevention in the Great Lakes Region of Africa. Available both in French and English, the Training Resource Manual works to provide a wide range of resources of particular importance to genocide and mass atrocity prevention in the Great Lakes Region. Designed to address existing areas of need, as had been identified by practitioners in the region, the Manual exists as a living document which will be updated regularly to ensure that it is providing the most relevant resources to its users. The training seminar demonstrated continuing growth in organizing for genocide prevention in the region and participants’ views showed progress in understanding the practice of preventing genocide. However, the enduring challenge is translating organization and understanding into tangible improvements in policies and programs that affect everyday conditions of the people. For more information on the Auschwitz Institute’s Africa Programs or the Training Resource Manual for Genocide and Mass Atrocity Prevention in the Great Lakes Region of Africa, please contact Jack Mayerhofer at jack.mayerhofer@auschwitzinstitute.org.